Wonderment Media is publishing FIVE books, all set in the Apocalypse Weird world, from five incredible authors. Immunity by E.E. Giorgi is already out. E. E. Giorgi is no stranger to this blog. I’m a big fan. 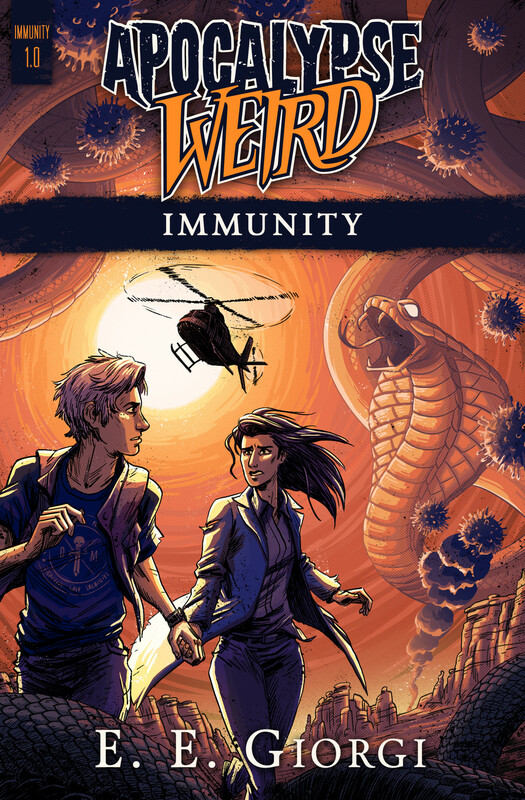 “Apocalypse Weird: “Immunity” by E.E. Giorgi was given to me as Advance Review Copy in exchange for a review. Having read other work by the author I was more than happy to accept this honour. “Immunity” is another powerful and fascinating thriller by this scientifically knowledgable and entertaining writer. The story starts strongly with a very dramatic scene and then introduces the plot of a viral outbreak that turns the infected into psychopaths. While the action and the suspense manage to keep up throughout the plot, there is – as in Giorgi’s previous novels – a very intelligent core subject about genetics that provides stimulating food for thought. I’m very interested in the topic and was amazed at the clever concept behind this gripping story. The book reads easily and is hard to put down. In a genre where much is repetition this book easily stands out for originality and a serious foundation in science. Convincing characters and great action add to the book’s credit. For fans of medical thrillers a must and highly recommended to everyone else.